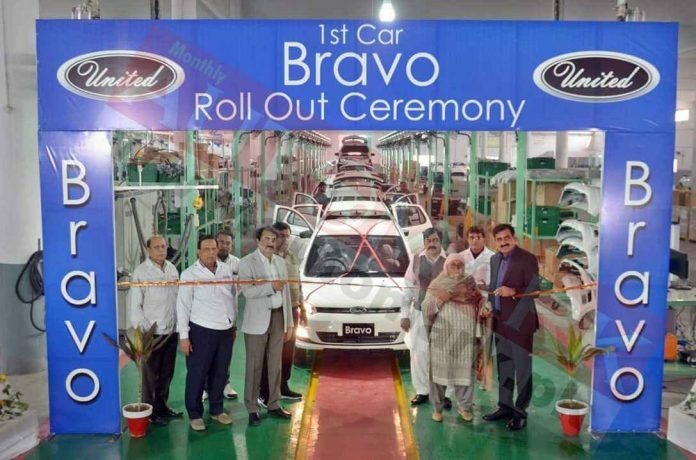 1st United Car ‘Bravo’ Roll Out Ceremony held at United Car Assembly plant on Nov 26, 2018 in Lahore. Ribbon Cut by Respectable Mother of Mr. Sana Ullah Ch,Mr.Zaka Ullah Ch,Mr. Abaid Ullah Ch and Mr.Zia Ullah Ch. “We thanks to Allah Almighty that today we are standing at an assembly plant of our locally assembled car, we hope that people will like our product and soon the vehicle will be available at our 3S dealerships.